Dali introduces compact Zensor Pico speaker range | What Hi-Fi? The Zensor series has been on a diet and the result is the Zensor Pico, comprising ultra compact speakers that use the same tweeter as the standard Zensor. The new range is made up of the Zensor Pico standmount and Zensor Pico Vokal centre speakers. The new speakers are approximately 30 percent smaller than their bigger brothers, but still manage to use the same 25mm tweeter. This is coupled with a 4.5in mid/bass driver and all housed within a small bass-reflex cabinet that’s wall-mountable. 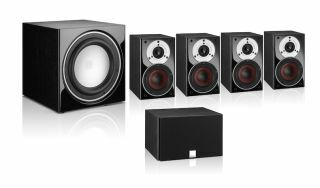 The new range can be used as a 5.1 surround sound package for rooms which lack space, and Dali recommends customers use two pairs of Zensor Picos, the Zensor Pico Vokal centre and the same E-9-F subwoofer from the Zensor 5.1 package. The new Pico range is available now in black, white or light walnut and so will match with the bigger Zensor speakers, which have the same finishes. The Zensor Picos are available for £159/pair, with the Pico Vokal costing £79. A complete 5.1 package with E-9-F subwoofer will set you back £779.